A neutered, "controlled Left/Progressive" opposition is a necessary adjunct to the prevailing neocon ideology. If we are to be effective, rather than complicit opposition, the Canadian and U.S. governments need to be exposed as the international rogue states that they are. The controlled-Left "enablers" are experts at denying, negating, and obscuring foundational issues. The neutered Left might ostensibly oppose imperialism and the commission of supreme international war crimes, but if its opposition is rooted in elements of the Big Lie, then it inadvertently helps to advance prevailing neocon rogue elements. When seemingly progressive politicians reinforce the "humanitarian" war propaganda lies, they enable the neocon warmongers by creating a false sense of opposition and "democratic" discourse. Humanitarian lies fabricate consent, and therefore provide a useful service to all warmongers. 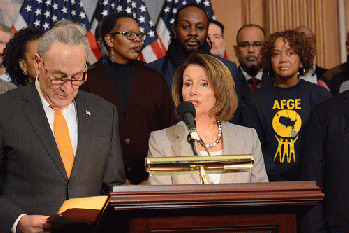 Criminal wars of aggression are bipartisan. Evidence-based reality inverts Rep Omar's war lies. 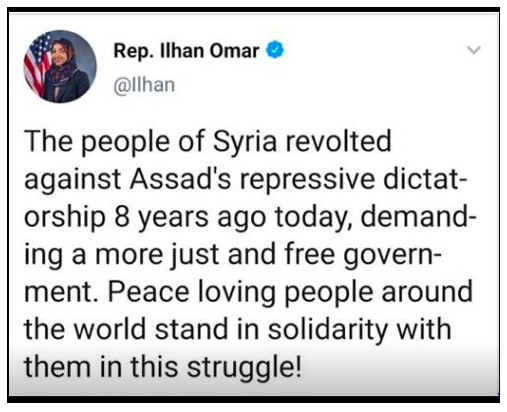 In fact, the CIA and assorted "intelligence agencies" displaced peaceful protests 8 years ago in a Regime Change operation aiming to destroy the overwhelmingly popular, democratically-elected government led by President Assad. In fact, terrorist-supporting people from around the world including the Canadian government stand in solidarity with the struggles of ISIS and al Qaeda. Frayed Colonial Media Propaganda Transmission Lines. Fake Atrocities Used to Justify "Humanitarian War Crimes"
A seemingly bruised and battered permanent war policy is strengthened when it is perceived to have withstood the rigours of "democratic" opposition. We need to generate an effective, legitimate opposition, by countering the war lies all of them with the truth.